6. He holds my hand when we walk to the bus. 7. He helps with the housework. 8. He always thanks me for the meals I prepare. 9. When he can't sleep, he uses headphones so that I can sleep without noise waking me up. 10. When he wakes up before I do, he has a hot cup of tea and a bowl of cereal ready for me when I wake up. I'm joining in the fun with the Happy Wives Club and linking up every Thursday! 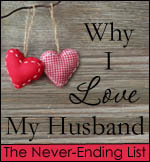 I encourage you to share your "Why I Love My Husband" list with your husband. Shower him with some praise and affirmation. In doing so, may the Lord richly bless your marriage. Love seeing this Why I Love My Husband list and enjoying watching it get longer.